According to this study, a calcium antagonist, nilvadipine, taken orally, may decrease the rate of mean deviation depression over time in patients with glaucoma. Further studies are needed for confirmation and to determine if benefits outweigh risks. 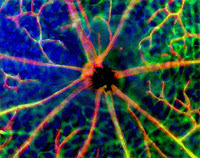 Theoretically calcium antagonists would increase bloodflow of optic nerve vasculature.